Bhojwani, J. Understanding the Cancer Stem Cell Mechanistic in Model-Systems. (2015) J Stem Cell Regen Bio 1(1): 24- 26. ©2015 Bhojwani, J. This is an Open access article distributed under the terms of Creative Commons Attribution 4.0 International License. Regenerative medicine is a relatively newly evolving branch in modern day medical innovations, which utilizes cell-based therapies that use healthy cells cultured in vitro/ lab to replace damaged cells/tissues in adult organisms, to treat disease or any accidental impairment. This, if achieved completely, could consequently hold the key for addressing and treating ailments, which currently have no promising cures; such as: Cancers, Neurological disorders, Alzheimer’s disease, spinal cord injury, cerebral palsy, brain stroke, muscular dystrophy, multiple sclerosis, diabetes, cardiovascular disorders, bone disorders, hematopoietic disorders, hepatic, renal and dermatological disorders. Earlier studies in stem cell biology have been focused mainly on the isolation and culture of tissue-specific stem cells from various sources and defining their unique properties. However, the challenge has now shifted towards understanding genetic programs controlling stem cell fate i.e. self-renewal and their multi-potential differentiation. Earlier studies have suggested a potential pathological role for Wingless (Wnt), Hedgehog (Hh), Notch (N) and BMP signaling pathways, which are all known to be well-conserved during evolution and have long been implicated in direct growth and patterning during embryonic development. Very recent data also indicates that these pathways are involved in post-embryonic regulation of stem cell number in epithelial derivatives such as skin and intestine, which undergo constant renewal since these cells have a relatively shorter life span. The oncogenic inactivation of these pathways can occur at many levels. In particular, an aberrant inactivation of canonical Wnt signaling pathway is a major feature in human neoplasia. Current evidence indicates that a typical transformation process also exploits a unique physiological dependence of intestinal progenitor/stem cell on the Wnt cascade, thus suggesting, that the Wnt pathway could be a common and critical element in regulating stem cell renewal and/or maintenance in a variety of systems. Some of the common, conserved and important signaling pathways between invertebrates and vertebrates (like, Wnt, Notch, Hh) and the factors that are involved in such pathways would be the major targets for such an investigation, involving a pertinent genetic approach. The Wnt protein is a versatile protein that stars in multiple cell dramas, from embryonic development to cancer. Wnt, turns out to have yet another important role. It coaxes blood stem cells to divide briskly, lending hope that it may make it easier to experiment on stem cells and effectively apply them in therapy. An integral involvement of Wnt cascade in both cancer and stem cell maintenance and growth of epidermal, intestinal and haematopoetic systems may serve as a classic paradigm for understanding the dual nature of self-renewal signals. It would be indeed very interesting to further exploit wg/Wnt-stem cell connection or other signaling pathways, for pinpointing those handful yet critical set of “genetic factors” which might be critically required for the tinkering of stem cell status to transformed status in cancerous tissues or even the transformed status in an experimental model organism, like Drosophila (fruitfly). One of the prominent features of cancer cells is their unlimited cell division capacity, reminiscent of self-renewing proliferation characteristic of stem cell, which is indeed very striking. Notably, these “blank slates” i.e., stem cells also respond to a tuned feedback mechanism, that efficiently senses the number of mature cells and regulates the rate of division, whereas in cancer cells, this mechanism is abruptly interrupted. Their difference apart, this particular feature helps the stem cells to repair and regenerate the lost tissue/cells after trauma/damage in the body. One of the building blocks of this kind of therapy are these very “stem cells”, since they possess the capability to multiply manifolds and also convert or differentiate into any specialized cell types of the body, when controlled by a programmed genetic cascade, which in turn, triggers these cells inside the body for any repair mechanism. Hence, the immense potential of these “natural assets” could well be projected, as far as, sometime in near future, to replace organ transplantation. Depending on the source, the potency or plasticity of stem cells varies and therefore, the choice of this source holds an immensely important role, especially owing to the risk of immune rejection of the foreign cells/tissues inside a host’s body, post-transplantation. Normally, the embryonic stem cells (ESCs) are considered to be the most efficient/pluripotent amongst all, since they have the potential to give rise to the whole embryo and cells of all the germ layers. However, since ESCs are surrounded by hordes of ethical issues for now, researchers and clinicians have tried hard to develop other sources such as the hematopoietic and mesenchymal stem cells from the bone marrow and the umbilical cord, adipose tissue, olfactory ensheathing, endometrium, neural stem cells etc. Uniquely enough, it has long been presumed that there is a rare sub-population in growing tumors, with stem cell-like properties (now known as “Cancer Stem Cells” or “Bad seeds” abbreviated as CSCs) and that, the process of tumorigenesis actually occurs at the stem cell level. The detection and confirmation of these “rare cells” is still under stringent investigation, since no promising and definitive markers are available for them (see Figure 3). Thus, it is indeed urgent to clearly understand basic molecular differences between stem cells and cancer cells, in model systems (like fly/mouse), which might be helpful in providing powerful insights into the inside mechanism of tumorigenesis, as well as potential therapeutic targets, in foreseeable future. A breakthrough study[3,4] in stem cell biology has clearly suggested that, stem cells can be derived by the genetic programming of adult skin cells by applying only a “few genetic factors”. This study also, in a way hits on the idea that, perhaps, it is only those “few genetic factors” that actually trigger or “ tip the balance” between the normal somatic cells and the stem cells or which may actually be required for the stem cells to acquire the transformed or transdetermined status. 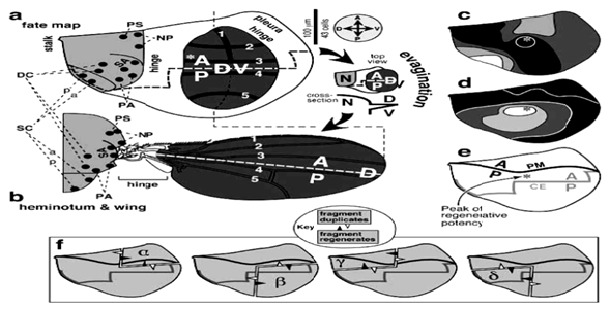 The adult organ precursors in Drosophila, i.e., the imaginal discs may serve as an ideal venue (See Figure 1) to explore such a possibility in vivo. When imaginal discs regenerate, specific groups of cells can indeed switch disc identity or “fate” so that, for e.g., cells determined for leg identity may switch to wing fate. Figure 1: Imaginal Discs in Drosophila: May serve as a promising and potential venue for exploration for stem cell mechanistic. Note that the zones of regenerative potential (*c,d,e) are pretty much defined (known as ‘regeneration blastema’ in wing imaginal discs), as shown in this illustration. 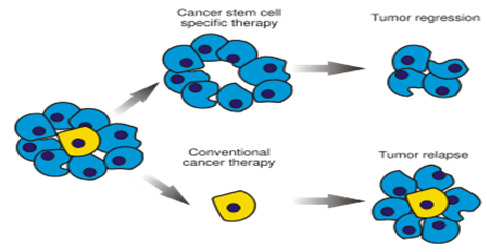 It is now firmly believed that, just a handful of aberrant stem cells (CSCs) maintain the growth of any cancerous tissue, because of which tumors often regenerate even after being almost killed by standard anticancer drugs (Figure 2). This also points to the fact, that it is high time for developing those anticancer drugs, which are precisely selected for lethality to CSCs and not solely for their ability to kill just any cells inside the body. The idea illustrated here, is directed towards understanding of such relevant mechanisms in the applied areas of regenerative medicine and therapy, by deploying simple genetic model systems, such as Drosophila (fruitfly). Tumor cells (hyperplastic:/benign; neoplastic/malignant), are most characteristically known for their unlimited cell-division capacity, reminiscent of self-renewing proliferation, typical of stem cells. Recent data has also clearly indicated that the transformation process exploits a very unique physiological dependence of intestinal progenitor/stem cell on the Wnt (counterpart of wingless in Drosophila) cascade, thus hinting, that Wnt signaling pathway may indeed be one of the key common/conserved elements in regulating stem cell renewal and/or maintenance in a variety of living systems. Figure 2: The Wrong Target- Traditional cancer therapies kill rapidly dividing tumor cells but may spare stem cells (blue) which are very rare (yellow), that can give rise to a new tumor. 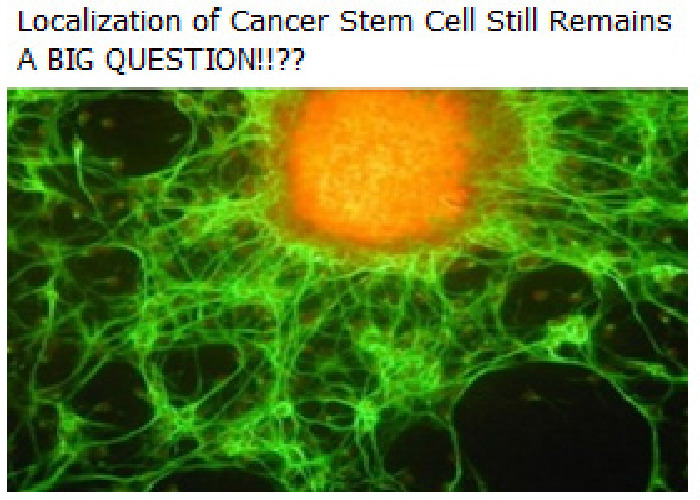 In theory, killing cancer stem cells (CSCs) should halt a tumor’s growth and perhaps even lead to its disappearance. The genetic factors thus identified in fly and/or other model systems (figure 3), will hopefully aid in understanding of mechanism by which “cancer stem cells” function in transforming a tissue from normal to hyperplastic (benign) and then to neoplastic (malignant) states. Especially, members of genetic pathways, which bear special relevance and convergence to both tumorigenesis and stem cell renewal/differentiation/lineage progression (like;Wnt, Hh, Notch-Delta), could be of prime interest as major targets. We have already found some encouraging clues on the components of Wnt-pathway, from our recent report on colorectal cancer[5,6]. It will be intriguing to know, if a similar pattern is also recapitulated in flies; as the genes in question are pretty conserved and have similar counterparts. This approach would presumably facilitate our perception of stem cell potential/ mechanistic in the areas of regenerative medicine and anti-cancer therapy. In distant future, stem cells may actually help repair diseased tissues, but there is a far more pressing reason to investigate them: Stem cells are the source and basis of at least some, and perhaps all cancers. Also, many of the self renewal genes are likely “oncogenes”. However, the work that still remains to be achieved, sooner than later, is to adequately and genetically condition the “blank slates/stem cells” to proficiently turn them into powerful regenerative tools for repair machinery inside our body. Figure 3: Detection of Cancer Stem Cells (CSCs) still remains a mystery pending the identification of definitive cell surface markers to locate them clearly in proliferative tumors! 1. Taipale, Beachy. The Hedgehog and Wnt signaling pathways in cancer. (2001) Nature 411: 349-354. 3. Takahashi, K., Tanabe, K., Ohnuki, M., et al. Induction of pluripotent stem cells from adult human fibroblasts by defined factors. (2007) Cell 131(5): 861-872. 4. Yu, J., Vodyanik, M.A., Smuga-Otto, K., et al. Induced pluripotent stem cell lines derived from human somatic cells. (2007) Science 318(5858): 1917-1920. 6. Bhojwani, J. Comparative expression profiling reveals a critical temporal requirement of CKI and hDlg in developing colorectal carcinomas. (2015) [in press].